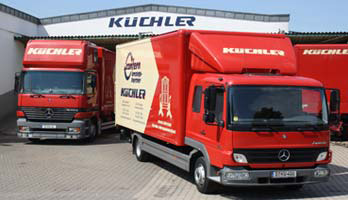 Office & corporate removals with KUECHLER – expert advice, safe handling with modern equipment and trained staff. In order to make the change of workplace as simple as possible for you and your employees, we can arrange the entire planning and move organization. We can give you extensive advice and guidance, taking into account the individual requirements of your relocation. We use specialized transport equipment which allows smooth and gentle handling of your goods. We can move your complete office records or library, as well as take care of your documents in accordance with German Data Protection Act requirements. In addition, we can transport, store, or dispose of your excess office furniture, IT and electronic equipment, certain types of hazardous waste, and other materials. We can arrange cleaning of your offices so that your old premises can be left in a clean condition.